Nias society was once governed by a rigid hierarchical class system consisting of an aristocratic ruling class, commoners and slaves. An array of regalia was used by aristocrats and commoners to mark status, in accordance with wealth and power. 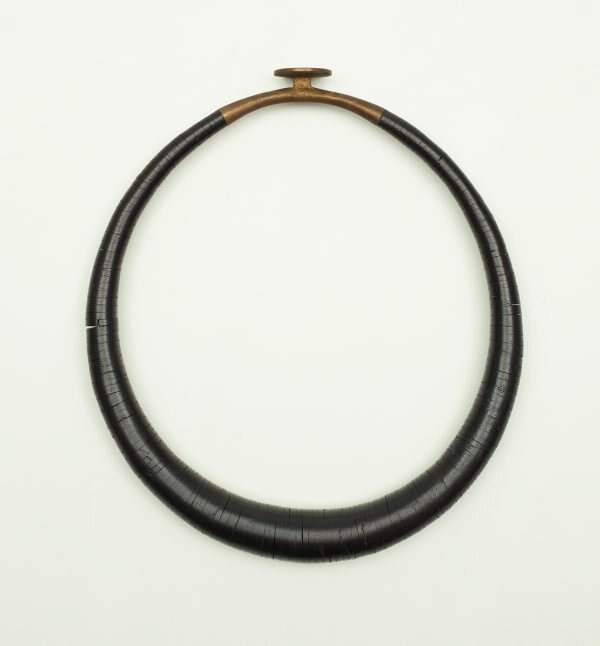 Comprised of polished discs of coconut strung onto a metal band, the ‘kalabubu’ was worn exclusively by males and once restricted to those who had attained the status of a warrior or headhunter. According to some early accounts of Nias culture, it was believed that an uninitiated wearer of a ‘kalabubu’ would be marked and punished by deafness. For the most chiefly aristocratic warriors, the elegant torque would have been covered in gold leaf, the ultimate marker of nobility and a connection with the gods. Following the prohibition of headhunting on Nias by the Dutch in the early twentieth century, the accoutrements of warriors continued to be used for ceremonial performances and honoured as ancestral heirlooms. Christopher Wilson, pre Nov 1986-1996, Sydney/New South Wales/Australia, probably purchased on Nias, Indonesia.This object appears in 'Southeast Asian tribal art', an unpublished text by Christopher Wilson, College of Fine Arts, Sydney, November 1986. Mariann Ford, 1996-Dec 2010, Sydney/New South Wales/Australia, inherited from the estate of Christopher Wilson. Gift to the Art Gallery of New South Wales as part of the Christopher Worrall Wilson Bequest 2010. Southeast Asian Tribal Art , Nov 1986, Plate 19 (colour illus.) unpaginated..
Ancestral art of the Indonesian archipelago , Sydney, 2017, 55 (colour illus. ).